Celebrities Barbara Streisand, Debra Messing, Jane Fonda, Catherine Zeta-Jones, Debbie and Carrie Fisher, and Glenn Close love their Coton de Tulear dogs because of their sweet nature, humor, unconditional love, and loyalty. For this reason, they take them everywhere- rehersals, broadway shows, television appearances, and book signings. Click here to view video. 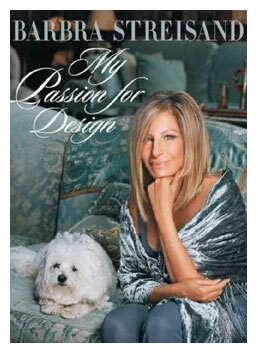 Barbra Streisand's Coton "Sammie" came from the Simply Grand Coton Kennel in Phoenix, AZ; We do not know where any of the other celebrities listed here got their dogs. 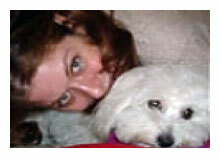 Barbara Streisand’s pet Coton Samantha is truly a beautiful, affectionate, loving girl with expressive eyes. Samantha or “Sammie” has been a star ever since Barbara brought her on the Oprah Winfrey Show. Barbara adores her loving companion. In addition to walking the streets together, Barbara takes Sammie to many of her concert tours, where on occasion she takes her to the microphone while singing. 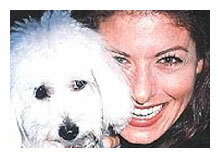 Actress Debra Messing loves and adores her sweet Coton dog Laila. In fact, she calls Laila her little "Angel." Laila has had lots of exposure to the press traveling with her mom on movie sets, benefits, and public outings According to Debra, "as an actress, I have the advantage of being able to take Laila with me to work. She has grown up on sets and is happiest there." One funny thing that Debra says about her dog is that, "for some reason people always think she's going to talk. It's the way she looks at people. There's something human about her gaze,"
Debra has also shared that Laila is so smart that she is bilingual. She understands commands in English and Spanish. When Debra was asked on an interview for a magazine about her favorite thing to do with her dog , she responded, "I like to give her a Shiatsu head massage." Jane Fonda adores her Coton de Tulear Tulea so much that she brings her just about everywhere she goes including stage rehersals, broadway, television shows like Davis Letterman, awards parties, book signings, and airplane trips. According to Jane, Tulea is very smart and follows her like a shadow. Jane says Tulea is such a good traveler that, "she hops into her carrying case in the airport when I say 'in'." Tulea knows what applause means. In fact, Tulea wriggled away from her backstage sitter and ran on stage while Fonda was taking a curtain call at the end of her broadway show "33 Variations'. Jane loves Tulea so much that she says, "when I am without her, I ache for her." Fonda also has stated, "she (Tulea) can be on my lap through an entire lunch and only when I standup to leave do people realize I've had a dog with me." Fonda considers Tulea to be her "soul mate", her confidante, and her wiggly security blanket. Catherine Zeta-Jones adores her Coton de Tulear boy so much that she brings him just about everywhere she goes, especially on daily walks in New York City, and to her stage performances. Figaro or "Figgy" is quite a celebrity in the theater world, according to actor Hunter Ryan Herdlicka. Herdlicka, Catherine's costar in "A Little Night Music", says Figaro is a regular member of Catherine Zeta Jone's entourage. "Catherine, she can't do a show without him. She doesn't go anywhere without him. She loves him so much. He's very, very sweet and very gentle." Figaro is normally on his best behavior during Catherine's shows, sitting quietly in a special 2ft. by 2 ft. area, right near the stage curtain. However, one night when Zeta-Jones was in the middle of singing her landmark number, "Send in the Clowns," Figaro started barking along. Herdlicka had to run over and quiet him down. 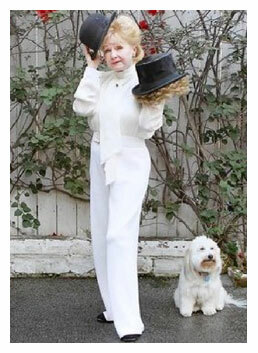 Debbie Reynolds finds babysitting her daughter Carrie Fisher's Coton de Tulear dog Dwight to be a pleasure. Recently Debbie and Dwight appeared together in a picture in the Los Angeles Times with Debbie holding hats once owned by Harpo Marx, and Charlie Chaplin. (see picture below). When interviewed Debbie had this to say about babysitting Dwight, "this is Dwight. This is Carrie's dog. I'm the grandma. 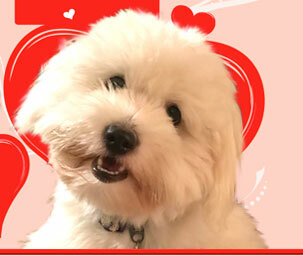 Carrie's dog is a Coton de Tulear, which is a fancy name for a dog, just an adorable little dog. Carrie left for the Bahamas today ……so Grandma is left babysitting with this little dog that I love."